The tomato is the world’s most popular fruit. More than 60 million tons of tomatoes are produced each year, 16 million tons more than the second most popular fruit - the banana. 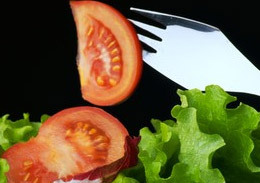 Tomatoes are rich in vitamins A, C, calcium and fiber and are cholesterol free. An average size tomato boasts only 35 calories. New medical research suggests that the consumption of lycopene(the ingredient that makes the tomato red), is an antioxidant noted for its ability to reduce the risk of prostate cancer in men. Tomatoes also contain antioxidants like carotenoids and beta carotene as well as offering protection against premature aging, cancer, heart disease and cataracts. Another interesting fact is that tomatoes are lipophilic, which means their nutritional value is increased by being cooked. Cooked tomatoes may be more beneficial to your health than raw tomatoes.